A young guard fell in love with Yokobue, but his father forbade them to marry. As he could not choose between the two, the distressed young man left to become a monk at Hōrin temple in the mountains. Yokobue went to see Ajō (the new religious name of the young man) and knocked on the temple gate. When he realised who it was, he too started to weep. Frightened she may persuade him to alter his decision from becoming a monk, he sent word that no one of his name was staying there. She left to become a nun. 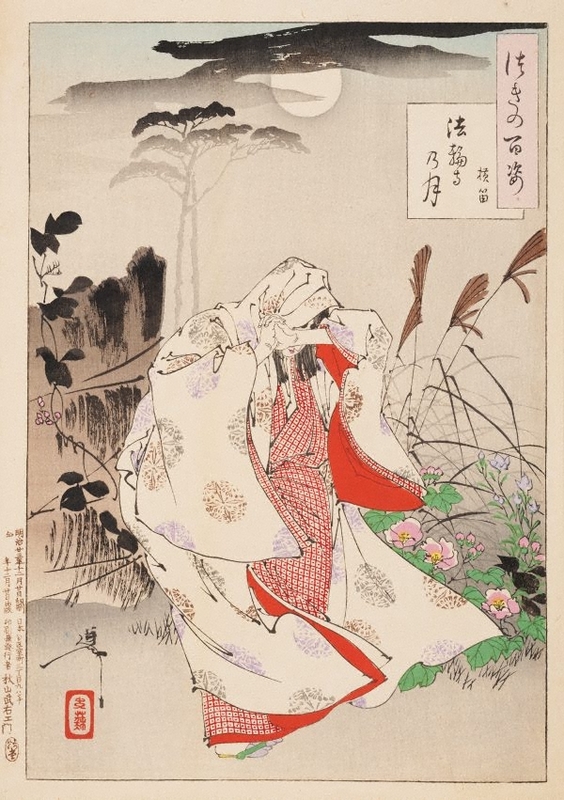 Yokobue is shown here as she comes down the mountain with sleeves wet with weeping, the dark clouds hovering over the distant moon. Her hands are clasped together indicating her distress. The interwoven pine trees, the symbol of lovers, fade into the background.